Refugees are legally authorized to work upon entry to the United States. As employment is a central tenant of the refugee program, refugees are mandated to participate in job readiness and English classes during their initial months in the U.S.
By definition, refugees are survivors of great adversity, having lost their homes, personal property and careers as they fled violence and persecution. Their need to regain self-sufficiency, their interest in acquiring new skills and their desire to attain economic stability for their families make them excellent prospects for hire. Each refugee resettlement agency provides job placement and case management services for employable refugees. They often assist clients in completing new-hire paper work and can provide additional support during the employer orientation and training process. Resettlement agencies can additionally be called upon for mediation services if communication issues arise. 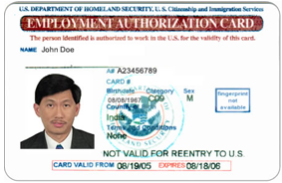 Refugees typically acquire their Employment Authorization Document (EAD Card, or form I-766) shortly after they arrive to the United States. A#: Alien Number. Any foreign-born individual who is authorized to work in the U.S. will have an alien number. Expiration Date: Please note that the cardholder continues to be work eligible beyond the expiration date. Refugees should have a social security card and/or their permanent resident card by this date, both of which satisfy the documentation requirements of the Form I-9.